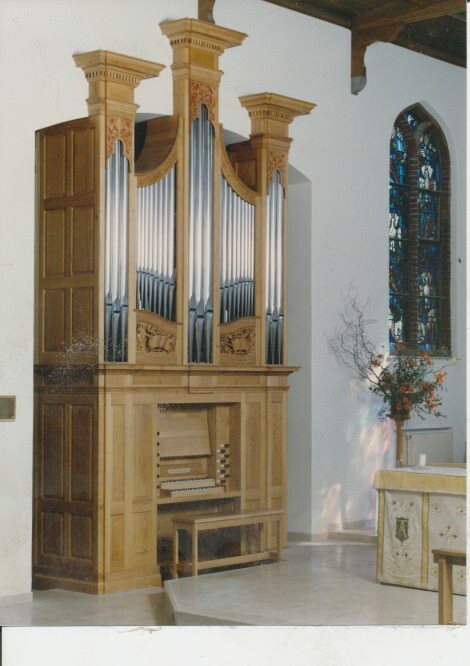 This is a new organ made in 1987. It is based on the organs of Richard Bridge at Christ Church Spitalfields (1735) and St Leonard Shoreditch (1756) in London. The case is based on the Richard Bridge organ at Holy Trinity, Newport, Rhode Island, USA (1733). The organ is in a chamber at the east end of the church overlooking the chancel area, but stands more or less in a separate case. The scaling of the principals is the same for each rank: 3:5 with a 12″ plate width at 51/3’G. The winding is provided by two 8 x 4 wedge bellows. The wind pressure is 63mm.